Lomalagi which means (Heaven) is situated directly along the ocean front among a half-acre of tropical gardens. It fronts onto a beautiful and secluded sandy white beach right in the heart of beautiful Matei. This home tenderly built by the owner and designed with exceptional views. Bali houses have long been a favoured architectural style for tropical settings and at Taveuni Estates, the owners of a rare Balinese home in the area have listed the ocean view property for a generous USD $200,000. This beautiful Soqulu Taveuni Estates Lot with beautiful ocean views. The late Audrey Brown was a prolific, long-time Taveuni resident whose servings of home-made cakes, coffee and chocolate on a veranda overlooking the sea became a customary stop for visitors to the garden island. New on the market is one of Taveuni’s most sought after properties located in the heart of Matei. The previous owner was the island’s famous Audrey Brown who specialized in serving cakes and coffee on the deck of her home overlooking the sea. A visit to this home was considered a ‘must do’ for visitors as recommended by Lonely Planet. With one look, it’s easy to see why Fiji ranks among the world’s most popular honeymoon spots: Waterfalls, rainforests and secluded beaches are all part of the everyday. A beach on Taveuni Island, Fiji’s third largest island. Just Listed and now Under Contract Unit 2A on the main road on Taveuni Estates. Close to the new resort and other facilities. This property did’nt last long as it was quickly bought up. With the potential of future hydro power the main road was always in high demand. Renowned for its captivating flora and fauna, Taveuni Estates continues to draw stellar interest from property buyers wanting a slice of Fiji’s Garden Island. 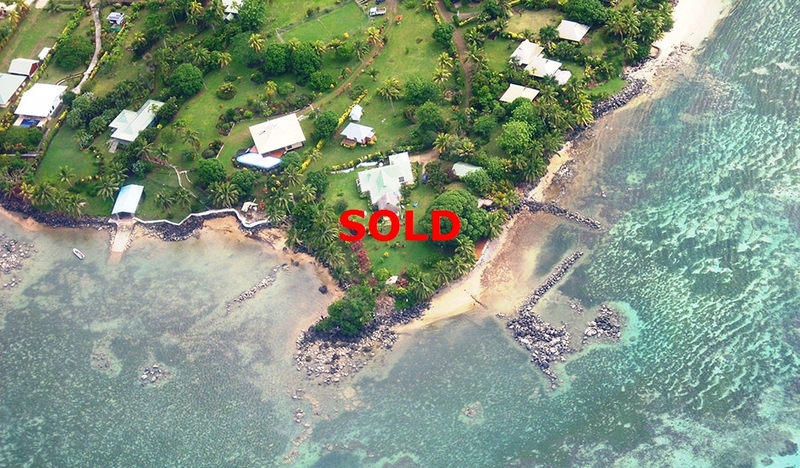 Much of Taveuni’s coveted oceanfront and resort lots are listed by Noble Realty, which facilitated a large number of properties late last year, when an amendment to the Land Act in 2014 sped up the sale of vacant foreign-owned lots whose proprietors did not construct dwellings within a 2-year deadline. A considerable number of these lots were listed at reduced values to meet the December 31 deadline and avoid hefty fines for their foreign owners. “We sold 68 listed properties for foreign owners and the majority of buyers have been locals,” Noble said. Buying interest, continues to thrive, with a single acre, ocean-front lot (Lot No.7) back on the Taveuni market at an asking price of US$100,000. The property encompasses a gentle slope with easy access to the sea, along Soqulu, one of the most stunning coastlines on the Garden Island. New listings include Lot 65 of Unit 1, and measures close to an acre, with a generous panorama over the sea and selling at an even more generous sum of FJ $30,000. “It’s on a quiet dead end with lots of privacy and has fantastic views that go on forever,” Noble said, adding that Taveuni Estates continued to be a popular choice for investors. I would just like to share with you a little of our coast line on Taveuni Estates. Please contact me for more information. Real estate agents and valuers have been urged to work with the Fijian Government in creating affordable housing for average and low-income earners. Another Lot in Taveuni Estates Under Contract on the main road. Taveuni Estates, Unit 5, Lot 52. 1 acre lot at the top end of Tabua Place, close to the southern edge of the Estate and the main coastal road. Taveuni Estates, Unit 5, Lot 51. Taveuni Estates, Unit 2B, Lot 47. Ocean view, 1 acre lot on Plantain Place. Taveuni Estates, Unit 2B, Lot 50. Taveuni Estates, Unit 2A, Lot 46. Half acre residential freehold block – excellent location on the Coastal Road next door to Taveuni Dive Resort. Just on the market this beautiful 1 acre freehold lot – an excellent building site. Matei has proved to be a popular location for buyers and previous listings in this area have sold pretty quickly – enquire now to avoid disappointment. Fantastic opportunity to own a piece of property in Matei. Originally owned by the famous Audrey Brown who subdivided some of her beautiful property into residential lots. These lots have all been sold and built on except lot #6 which is now currently being sold by its owners. The lot is flat and offers unobstructed ocean views. This won’t last long Please enquire. Beautiful 10 acre lot with home in Qila at the northern end of Taveuni. One of the most beautiful spots in Fiji Viani Bay – 35 Acres with 300 Feet of flat beach front !! This breathtaking beachfront property, successfully running a profitable rental accomodation as well as private residence, is now available to a new owner wishing to continue the business or simply live the dream.